Oct. 24, 2013, 10 a.m. The new study seems to indicate that news-seeking plays a smaller part in Facebook usage than publishers might like. By Justin Ellis @JustinNXT Oct. 24, 2013, 10 a.m.
Do people go to Facebook for news? We have an answer: Generally, no. According to a new study from the Pew Research Center, only 16 percent of Facebook users say getting news is a major reason they use the social network. Only 4 percent say it’s the most important way they get news. So can the news be effective when it’s competing with status updates on new babies, photos from last night’s party, or updates from college friends? Maybe. Traffic from Facebook is growing, but Facebook users don’t click news links all the time: “Two-thirds of Facebook news consumers, 64%, say that they at least sometimes click on links to news stories. Still, just 16% do this often,” the report says. But the Pew report does emphasize the fact that Facebook users are young and increasingly mobile, two audience segments the news industry could use some help with. The study says young people (ages 18 to 29) make up 34 percent of Facebook news consumers, versus only 20 percent of Facebook users who don’t consume news there. Here are five takeaways from the study that might be of interest to media companies. If you get news on Facebook, you spend more time there. If you like news on Facebook, you really like news on Facebook. They are nearly five times more likely to ever see headlines about the latest stories (55% versus 12% of other Facebook news consumers), seven times as likely to click on links to news stories on Facebook (64% to 9%), six times as likely to “like” or comment on news stories (73% versus 12%) and far more likely to discuss issues in the news with other people on Facebook (39% to 2%). And, more than half, 56%, of those who often post or share news have used Facebook to keep up with a news event as it was happening, roughly twice that of other Facebook news consumers (25%). While entertainment was the most common sort of news seen by users on Facebook, the next runner up was what Pew calls “news about people and events in their own community,” ahead of even sports and national politics. That sounds like local news, right? Maybe. Further down that list of news Facebook readers see most, on the lower end of the spectrum, are local government and politics and local weather and traffic. Pew also found that if you are the type of person who likes to share news on Facebook, you’re more likely to get some kind of local information: 81 percent of people who share news on Facebook are getting community news and events on the site. Name recognition matters on Facebook. Except when it doesn’t. Nearly every news organization and many individual journalists have a Likeable presence on Facebook. But Pew’s findings are a little murky on the subject of whether an association with a journalism company or reporter makes a difference in how people interact with the news. Even if you do fancy yourself a news consumer on Facebook, you’re likely committing to the outlets you’re already familiar with and have some relationship with. Maybe it’s your local paper or TV station, or you follow social feeds from NBC News or CNN elsewhere. Either way, Pew says 72 percent of the Facebook users who like or follow media outlets say the news they find on the site is the same sort of news they see elsewhere. Just 20 percent of Facebook news consumers say they click on a story because its from a news organization they “prefer,” according to Pew. Two-thirds of people who get news on Facebook have it sent their way by Facebook friends rather than by news outlets; only one-third of news consumers on Facebook follow or like news outlets or individual journalists, the report says. Those who “like” news organizations, reporters or commentators on Facebook are more likely than other news consumers on the platform to see headlines, click on links, comment, post stories and discuss issues in the news. They also are more enamored of the Facebook news experience overall. The vast majority, 84%, enjoy seeing posts about news mixed in with other kinds of posts. The future is still mobile. POSTED Oct. 24, 2013, 10 a.m.
Ellis, Justin. 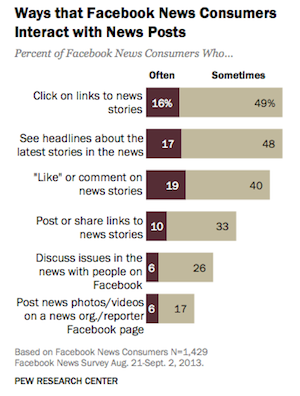 "Bumping into the news: New Pew data shows Facebook users find news there, but don’t seek it out." Nieman Journalism Lab. Nieman Foundation for Journalism at Harvard, 24 Oct. 2013. Web. 23 Apr. 2019. Ellis, Justin. 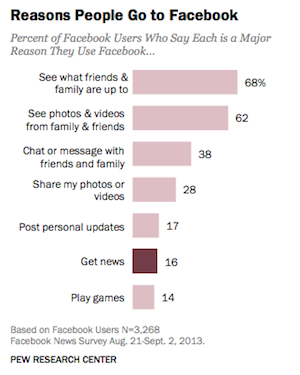 "Bumping into the news: New Pew data shows Facebook users find news there, but don’t seek it out." Nieman Journalism Lab. Last modified October 24, 2013. Accessed April 23, 2019. https://www.niemanlab.org/2013/10/bumping-into-the-news-new-pew-data-shows-facebook-users-find-news-there-but-dont-seek-it-out/.